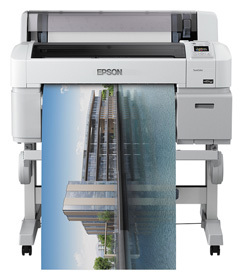 Epson SureColor T3200 is a technical printer that delivers large-format colour and black-and-white images, economically and at high speed, making it an ideal printer for engineers & the CAD market. The SC-T3200 from Epson is flexible and compatible with a wide range of media and support ultra-high resolution print with dense and consistent colour and the output that dries almost instantly to be water and rub resistant. It also features Epson’s latest PrecisionCore™ print head and aqueous UltraChrome® ink chemistry. This large format technical CAD printer is designed for business and corporate environments, can print an A1 image in as little as 28s and is extremely cost-effective to run with low power and low ink consumption. This printer is available in different configurations, either a desktop or floor-standing configuration, it has a small footprint, and can be installed against a wall or in a corner. Its software and applications enables easy printing from office as well as remote management facilities. Click here to download the full specification sheet for the Epson SC-T3200.